View More In Uninterruptible Power Supply (UPS) - Page 2. 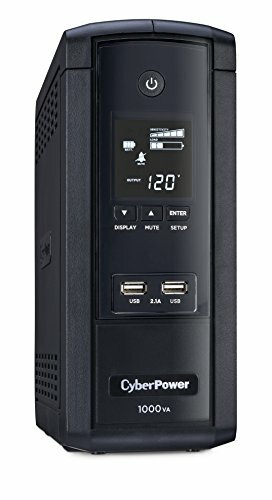 The CyberPower Intelligent LCD Series BRG1000AVRLCD uninterruptible power supply (UPS) safeguards PCs and other electronics (monitors, cable DSL/ modems, VoIP routers, and home theater devices) from blackouts, brownouts, surges, spikes, sags, and other power abnormalities. Its Automatic Voltage Regulation (AVR) boost/buck technology delivers a consistent and clean AC power, protecting connected equipment and preventing costly business interruptions. Two (2) 5Vdc USB 2.1A charging ports provide charging power for portable devices such as tablets, mobile phones, MP3 players, and cameras. This UPS system is ENERGY STAR qualified with patented Green Power UPS Bypass circuitry to save on energy costs by reducing energy consumption and heat buildup. The BRG1000AVRLCD unit has a capacity of 1000VA/600Watts, ten (10) NEMA 5-15R receptacles, including, five (5) battery and surge protected and five (5) surge protected outlets. This UPS has a 12-volt maintenance-free sealed lead acid battery. The intelligent multifunction LCD panel displays real-time UPS vitals and has user settings for sensitivity, illumination, and the audible alarm. This unit offers connectivity via one (1) HID USB and one (1) DB9 serial ports. Protection for phone/network (RJ11/RJ45) and cable/coax (RG-6) is included. Its composite integrated circuitry offers advanced lightning protection and EMI/RFI filters increase the immunity of the load to disturbances and surges. A HID compliant USB port provides connectivity to the BRG1000AVRLCD. Power Panel Personal Edition UPS Management software is included to monitor the vitals of the UPS and will safely shutdown the system in case of a power outage. A Five-Year Warranty ensures that this UPS has passed our highest quality standards in design, assembly, material or workmanship and further protection is offered by a $350,000 Connected Equipment Guarantee.